A point within the workflow where a single thread of control splits into two or more parallel activities. The execution of parallel activities commences with an AND-Split and concludes with an AND-Join. For example, in a credit application process there may be a split in the workflow at which point multiple activities are completed separately (in parallel, if not simultaneously.) At an And-Split separate threads of control within the process instance are created; these threads will proceed autonomously and independently until reaching an And-Join condition. 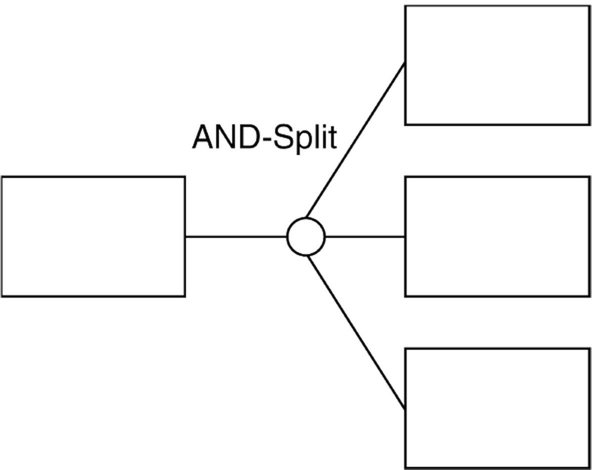 In certain workflow systems, all the threads created at an And-Split must converge at a common And-Join point (Block Structure); in other systems convergence of a subset of the threads can occur at different And-Join points, potentially including other incoming threads created from other And-split points (Fig. 1).